Despite all the challenges and hardships that she and her family have faced in recent months as her dad, Amos Ablanalp, lay in a hospital bed with stage four colon cancer, fighting for his life, 13-year-old Evie Clair continues to press forward. Each of her heartfelt performances has left both the audience and judges awestruck at her amazing musical talents. When asked what she would do with the $1 million prize money if she won, she unselfishly replied that she would use the money to save her dad’s life. She continued, “If my dad is better by the time the show is over, then I would use all the money to pay off all the medical bills and go to Disneyland. If he is not better by then, I would use it to go and find a treatment that works because there are, obviously, treatments out there that work, but they are far away and expensive.” With her faith and tenacity, is it any small wonder that everyone she meets has fallen in love with her? 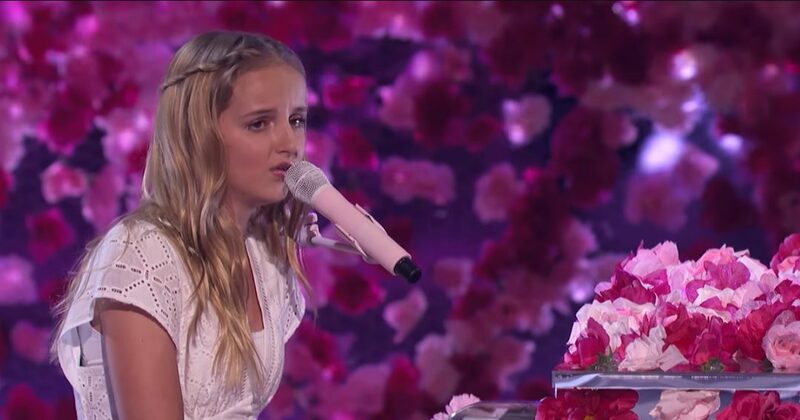 Evie will compete in the finals next Tuesday, which will be aired live on NBC at 7 p.m.
Evie recently testified in a Facebook post that “families are forever” after posting an emotional photo of the funeral. Accompanied by a simple piano arrangement, Evie held her composure through the emotional rendition of the Armstrong cover as a light waterfall cascaded down behind her. In an Entertainment Tonight interview, Evie said, “I just prayed before that I would be able to do that. I feel like I really had strength from God, and I know my dad was there.” About her song choice, she said, ““That was my dad’s favorite song. He would always sing that.” Silence permeated the theater as her emotional rendition brought many in the audience to tears. Evie Clair ultimately finished ninth in the competition. However, in the eyes of many people who have followed her journey, she is now and always will be a winner.